I have a large collection of indies that are a year old or more that I haven't gotten around to swatching. I am determined to start getting through some of them because they are really pretty!! Some may not be available from the maker anymore, but there are always blog sales and such. Smitten Polish Radiant Orchid is one such beauty. This is a gorgeous purple-y pink linear holo, in honor of the 2014 color of the year, Radiant Orchid. The linear holo flame is very strong in this polish. This is a tad darker and more purple in person, I think the rainbows confused my camera a bit! This is two coats of Radiant Orchid and the opacity is perfect. The formula is great and super easy to apply. 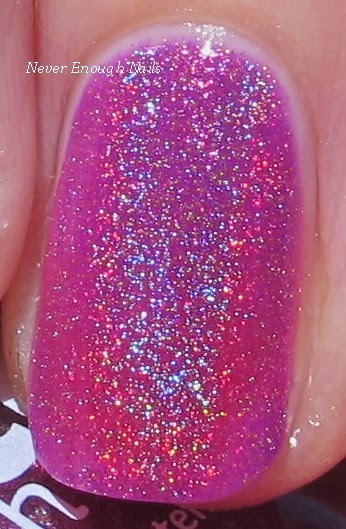 Smitten Polish Radiant Orchid is still available at smittenpolish.bigcartel.com!